The Brazilian Cancer Foundation is a non-profit institution that raises funds and invests in cancer prevention, early diagnosis, assistance, programs and projects related to transplants of bone marrow and umbilical cord blood, as well as palliative care and research. Its mission is to promote strategic actions for prevention and control of cancer on behalf of society at large, and also to support the Brazilian National Institute of Cancer (INCA) and all activities of the Brazilian National Cancer Control Program. Moreover, it further provides consulting services for states and municipalities throughout Brazil so they can improve their processes in the treatment of cancer (Oncologic Attention Plan). Cancer is considered a very serious public health problem all over the planet and its incidence has risen by no less than 20% in the past decade alone. In Brazil it is the second leading cause of disease-related deaths. Estimates for 2015 indicate that there will be roughly 580 thousand new cases in our nation this year. According to the UN’s World Health Organization (WHO), expectations for the year 2030 are 27 million new cases and 17 million deaths. Developing countries will be the ones most affected, including Brazil. The dreaded disease is one of the world’s major concerns in terms of public health policies. Given this scenario, it is fundamental for the entire society to participate in the fight against cancer. To learn more about our actions, click here and access the English version of the Cancer Foundation’s Annual Report – 2014, or get in touch with us through our institutional e-mail address: comunicacao@cancer.org.br. The Cancer Foundation has played an important role in the victories and advances obtained by Brazil in the area of marrow transplants. This support comes in many forms, all the way from campaigns to mobilize donors to management and logistical structuring of projects. The entity is a partner of INCA’s Bone Marrow Transplant Center (Cemo) – a national benchmark in the treatment of hematologic diseases. The Cancer Foundation is responsible for managing the project for expansion of the Brazilian Network of Public Umbilical Cord and Placenta Blood Banks – Rede BrasilCord (the BrasilCord Network), which is technically supervised by INCA and financed by the Brazilian Development Bank – BNDES. Created in 2004, the BrasilCord Network is made up of 13 public blood Banks that store donated samples of umbilical cord blood, which is rich in stem cells and capable of reproducing the fundamental elements of blood that are essential for marrow transplants. The blood banks are located in every single region of the nation – in the North [Belém in the State of Pará (PA)], in the Central-West [the nation’s capital Brasília (DF)], in the Northeast [Fortaleza in the State of Ceará (CE) and Recife in the State of Pernambuco (PE)], in the South [Porto Alegre in the State of Rio Grande do Sul (RS), Florianópolis in the State of Santa Catarina (SC) and Curitiba in the State of Paraná (PR)], as well as in the Southeast [Lagoa Santa in the State of Minas Gerais (MG), Rio de Janeiro in the State of Rio de Janeiro (RJ), and Campinas and Ribeirão Preto in the State of São Paulo (SP), plus two in the capital of the latter State – the City of São Paulo]. Since 2006, the Cancer Foundationhas been in charge of management of the project for expansion of this network, with funding provided by BNDES. The first phase of the project involved transfer of R$ 4 million for expansion of INCA’s umbilical cord blood bank. In the second phase, which involved transfers of no less than R$ 32 million, seven new blood banks were built and the four already existing were remodeled, so as to provide them with more appropriate equipment and better-trained personnel. The third phase of the project began two years ago, in the month of July 2013, with transfer of R$ 23.5 million by BNDES. This latest phase includes construction of four new umbilical cord blood banks in the cities of Manaus (State of Amazonas – AM) in the North, Campo Grande (State of Mato Grosso – MS) in the Central-West, and São Luís (State of Maranhão – MA) and Salvador (State of Bahia – BA) in the Northeast, for a total of 17 umbilical cord blood banks. 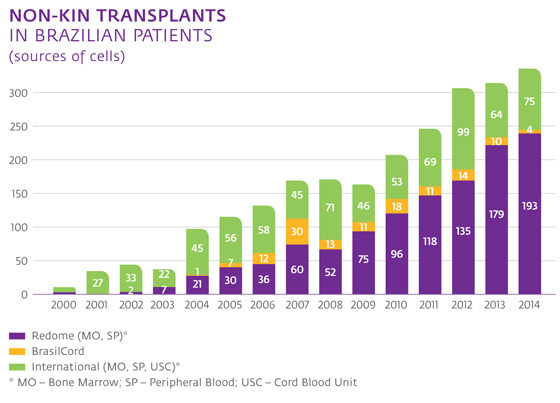 With conclusion of the project for expansion of the BrasilCord Network, slated for 2016, Brazil will have capacity for storing a total of 80 thousand pouches, expanding the chances of patients requiring marrow transplants. The Foundation’s activities include the detailing of the architectural and engineering designs, contracting the civil construction, installation and specialized technical services, such as information technology, as well as purchase and installation of equipment and acquisition of operational and support materials. Our work also encompasses the logistics for training specialized personnel and controlling timetables so that the projects are delivered within the deadlines. Donating the umbilical cord of a newborn infant to a public blood bank is voluntary and has to be authorized by the baby’s mother. The units stored are available for any person requiring a marrow transplant, such as patients with leukemia and other blood diseases. The more umbilical cords are stored, the greater the number of people who can benefit. The blood banks of the BrasilCord Network have agreements with certain maternity wards to pick up the cords. Donations can only be carried out at such credentialed hospitals, where there are teams on hand that have been trained to properly approach the pregnant woman, accompany her birth and gather the material at the moment the child is born. The Brazilian National Register of Marrow Donors (Redome) was created in 1993 in São Paulo; as from 2000 it was transferred to Rio de Janeiro, where technical management was put under the charge of INCA’s Bone Marrow Transplant Center (Cemo); and ever since 2009 it has been able to count on the administrative and financial management of the Cancer Foundation. Now it is the world’s third largest register of voluntary marrow donors, with 3.5 million donors registered, putting it behind just the United States and Germany (the American register has almost 7.7 million donors while the German one has around 5.7 million). Redome is linked to the registers of the entire world. At present searches for potential donors for Brazilian patients are carried out simultaneously in Brazil and overseas. The international registers also access the data of donor candidates based on specialized systems. 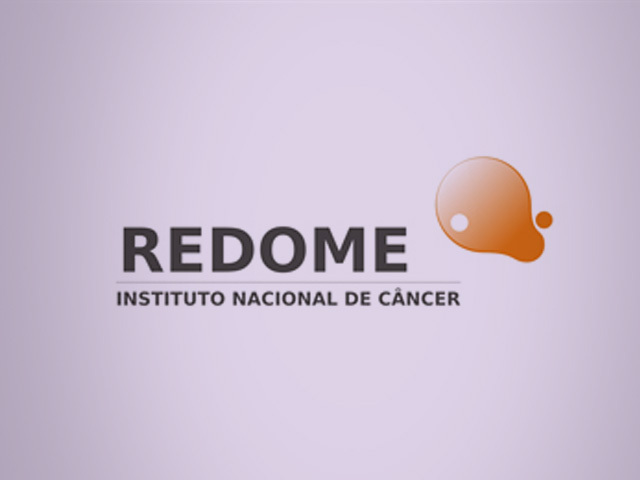 The functioning of Redome is directly related to the BrasilCord Network and to the Program for Search, Pickup and Transportation of Stem Cells for Non-Kin Marrow Transplants in Brazil and the National Register of Bone Marrow Recipients (Rereme). The entire process for Redome consulting and searching is automated. The doctor in charge inserts the register and clinical information on the patient, including the results of their histo-compatibility exam – HLA (which identifies the genetic characteristics of each individual), — on the Rereme system. Once the data is approved, the search begins. When potentially compatible donors are identified, the information is transmitted to the doctor who, together with the Redeme search team, can analyze the best potential donors and make choices for the confirmation tests to be carried out. After the search phase is concluded, if availability of the donor is confirmed and the patient is able to continue treatment, the donation procedures are commenced. The donor selected is invited to undergo clinical appraisal and removal of the material for donation can be performed at the qualified hospital closest to the donor’s residence. After removal, the material is transported to the center where the transplant will be conducted. A marrow transplant is a type of treatment indicated for certain diseases that affect the blood cells, such as leukemia. It consists of replacing a diseased or deficient bone marrow with normal bone marrow cells, in order to reconstitute a new healthier marrow. The transplant is performed based on material gathered from a donor or based on stem cells from the umbilical cords of the newborn, which are obtained and crio-preserved on the basis of voluntary donations authorized by the mothers of the babies. The blood banks of the BrasilCord Network (Rede BrasilCord) have agreements with maternity wards for pickup of the umbilical cords. You have to be between the ages of 18 and 55, be in good health and not have any infectious disease that can be transmitted by blood. Donor candidates should seek out the blood bank closest to their homes, where they will be put on the schedule to clear up doubts regarding donations and then have a 5 to 10 ml blood sample taken in order to determine the type of their HLA (genetic characteristics that are important in selecting donors). The donor’s data are then inserted on the Redome register and, whenever a new patient inquiry is made, compatibility will be checked. Once this is confirmed, the donor will be consulted to decide on the donation. A marrow transplant is a safe procedure and there are two manners of carrying it out, with the doctor choosing the most appropriate method for each case. One of the options is removing marrow from inside the donor’s pelvic bones by means of needle punctures. The procedure is carried out in a surgical center with the patient anaesthetized. In the other transplant option, donors take medication that makes the bone marrow cells circulate through their blood veins. Such cells are then removed from the donor’s arm veins, and the procedure includes use of a specific machine (aphaeresis) to separate the blood cells required for the transplant. In both procedures, the donor’s bone marrow is reconstituted in just 15 days. List of blood banks throughout Brazil. Donor candidates should keep their data updated on the Redome. To access the form for doing this, click here. In the second half of 2015, the Cancer Foundation will be starting up the National Radiotherapy Training Program. The objective is to train 20 physicists with a transdisciplinary view and 80 radiotherapy technicians and also to provide updating courses for 300 doctors, radiotherapists, technicians and physicists. The project further includes developing and making available an ongoing virtual learning environment to train residents and update radiotherapy doctors, physicists and technicians throughout the country. In the line of oncologic care, radiotherapy is recognized as an essential component of assistance for cancer patients. About 60% of them will benefit from such therapy at some point in their treatment, and results indicate a cure rate of 50% on an isolated basis and 60% when associated with chemotherapy or surgery. The National Radiotherapy Training Program was conceived of by the Cancer Foundation and developed in partnership with INCA’s Instruction Department and UERJ’s Radiologic Science Laboratory in order to supplement the training and updating courses for radiotherapy area professional, pursuant to the requirements of the SUS, in conformity with the Health Ministry’s National Radiotherapy Program. Created by the Federal Government, the National Radiotherapy Program involves the purchase of 50 machines to be installed at 50 new treatment centers and 50 machines to be installed at existing centers that need updating. The bidding process for purchase of the equipment included the requirement for the company winning the bid to set up a manufacturing plant in Brazil. Such a decision will no doubt provide medium- to long-term benefits (5- to 10-year time frame), with installation of new centers and replacement of obsolete equipment. Even so, the greatest impact of the National Radiotherapy Program will be even more long term, what with production of equipment in our country, making the machines cheaper due to the reduction of taxes and the possibility of financing in Brazilian currency, creation of jobs and technical know-how. The acquisition of radiotherapy machines, besides including future production here in Brazil, will also no doubt expand our capacity to handle cases and cut down the waiting time for treatment. Nonetheless, as radiotherapy is a highly complex process, characterized by a specific physical structure, a differentiated technological park and multi-professional action (doctors, physicists, technicians, nurses) in the various stages of planning and execution, adequate training and updating of the human resources involved are just as fundamental as the availability of the equipment. Hence the importance of the National Radiotherapy Training Program as proposed by the Cancer Foundation. The program for updating and training will begin in the second half of 2015 and involve a group of 20 companies and two individual donors that will carry out the execution phase of the program that will contribute mightily to improve the quality of radio-therapeutic treatment in Brazil. The National Tumor & DNT Bank in Brazil (BNT) is the first public bank of this type that is nation-wide in scope. It arose based on an initiative of INCA’s Research Coordinating Office that was aimed at setting up the first Brazilian network for collecting and transferring to the Institute’s Research Center samples of tumors and blood from patients with the most common tumors in the country – based on their frequency and death rates – for definition of their genetic profiles. Construction of the BNT was managed by the Cancer Foundation and its infrastructure was developed in 2004 with funding provided by the Brazilian Government’s Finance Agency for Studies & Projects (Finep) and the Swiss Bridge Foundation, which is a non-profit entity based in that European nation. A bio-data-processing platform was specially created to organize and store BNT data that began functioning in 2005. Centralization of data allows research studying the behavior of tumors based on the genetic standard of the Brazilian population and defines diagnoses and treatments with greater speed and safety. The current storage capacity of BNT is roughly 88 thousand samples, which are donated by patients undergoing surgical procedures in all the medical-surgical services of INCA’s hospitals. More than 25 projects approved by INCA’s Ethical Research Committee(CEP) were carried out with biological samples taken from patients registered at the institution, thus leading to technical-scientific collaborations with Brazilian and international research groups. The results achieved with these research projects may make a marked contribution to actions for cancer prevention and treatment, through enhancement of technologies oriented to diagnosis of the disease and identification of molecular markers that can serve as “targets” for specific therapeutic activities in various types of cancer. The challenge now is expanding the collection of samples with implementation of the Brazilian Bio-Bank Network, a technical-scientific cooperation exercise with cancer assistance and research institutions associated with the BNT, located in other regions of the country. Another initiative led by the BNT was creation of the Network of Tumor Banks of the Latin American & Caribbean Alliance, the main objective of which is establishing actions aimed at setting standards for bio-bank processes – standard operating procedures, analysis of costs of biological samples, etc. – in governmental oncologic attention institutions. So far, the following countries participate in this network: Argentina, Brazil, Chile, Colombia, Cuba, Ecuador, Peru, Mexico and Uruguay.